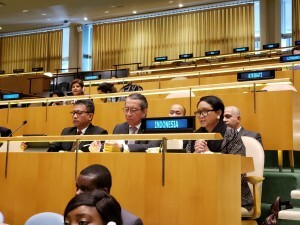 Minister of Foreign Affairs Retno Marsudi speaks at the United Nations General Assembly, Tuesday (2/4). Photo by: Ministry of Foreign Affairs. 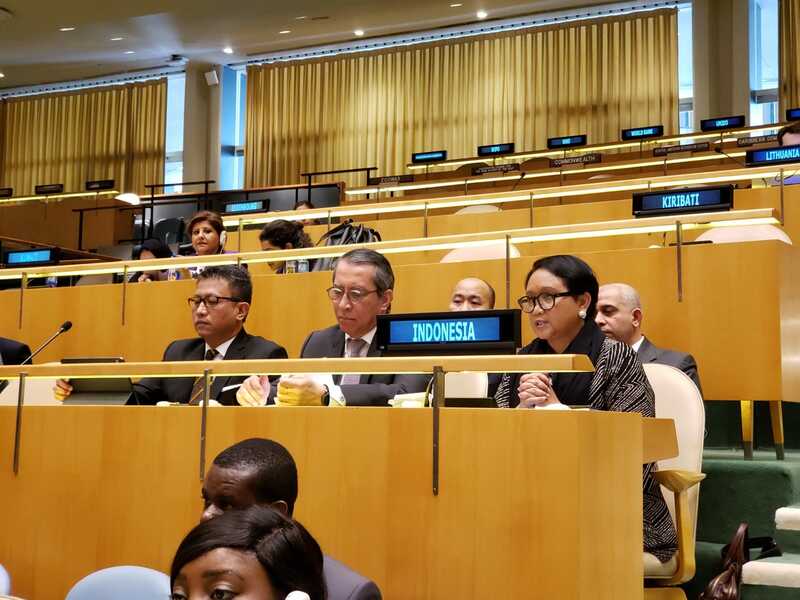 A joint action is needed to encourage global inter-religious and inter-civilization dialogs to promote tolerance and peace, Indonesian Minister of Foreign Affairs Retno Marsudi has said. The Minister made the statement during the ratification of the United Nations General Assembly Resolution to Fight Terrorism and Acts of Violence Motivated by Hatred against Religion, in New York, Tuesday (2/4). 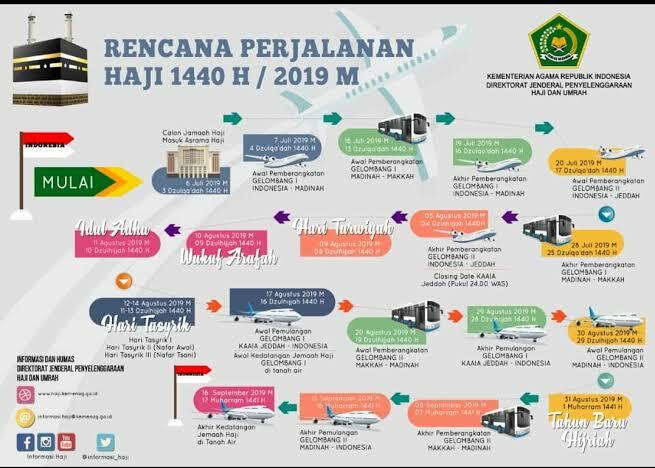 Ministry of Religious Affairs has recorded that 75 percent out of the total of hajj pilgrims candidates has already paid Hajj Pilgrimage Cost (BPIH) for this year’s hajj season. “As of 2 April 2019, 153,333 hajj pilgrim candidates have paid their BPIH,” Director for Internal Hajj Services at Ministry of Religious Affairs, Muhajirin Yanis said in Jakarta, Wednesday (3/4). 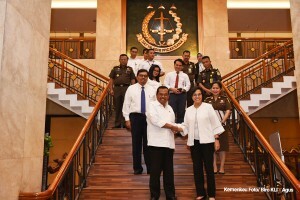 Ministry of Foreign Affairs has checked readiness of a number of Indonesian embassies and consulates abroad ahead of legislative and presidential elections this month. “There are 130 Overseas Election Committee (PPLN) located in 96 countries,” said Wajid Fauzi, Special Advisor to Foreign Minister on Management during Public Relations Forum in Jakarta, Thursday (4/4). President Joko “Jokowi” Widodo on Wednesday (4/3) attended an amicable gathering with Farmers Group (Gapoktan), Indonesian Rice Millers and Entrepreneurs Association (Perpadi) across Central Java and had a dialog with them, at Diponegoro Sragen Sports Hall (GOR), Sragen Regency. On this occasion, one of participants who is a rice mill entrepreneur admitted that though his business have been running since 2001, the process to dry rice is still done manually because he does not own a rice drying machine. 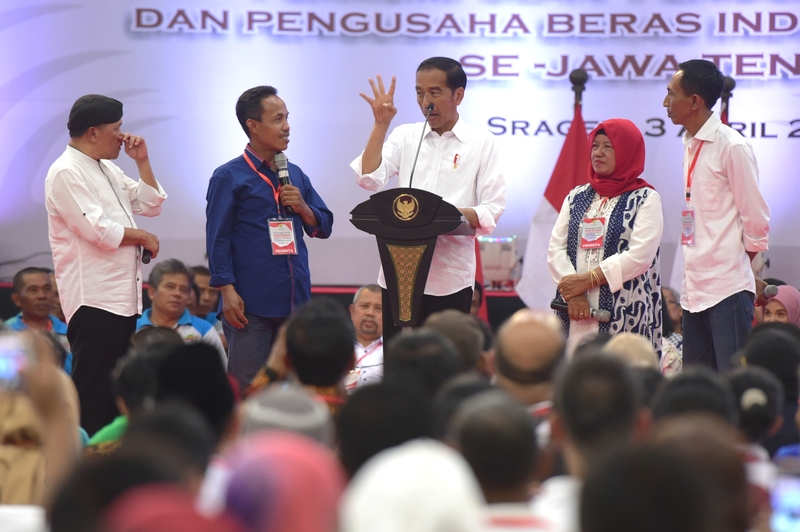 President Joko “Jokowi” Widodo urged Central Java’s Joint Farmers Group (Gapoktan) and Indonesian Rice Millers and Traders Association (Perpadi) to improve agricultural production equipment. 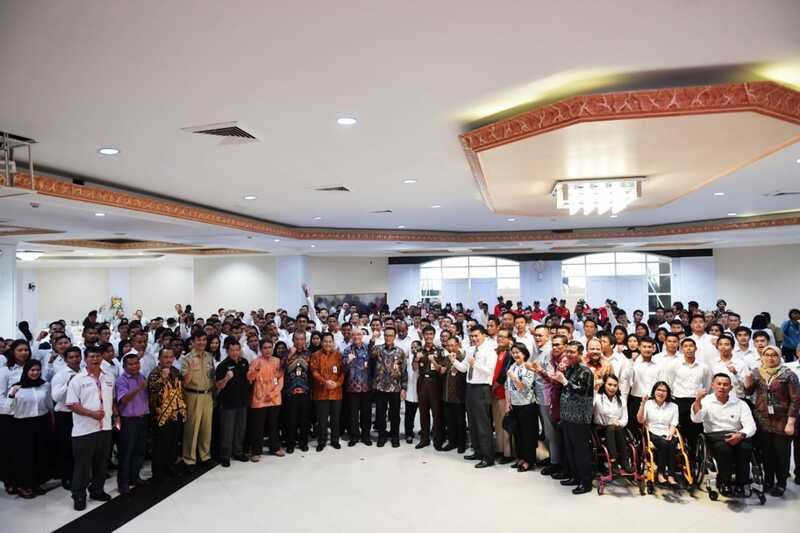 According to President Jokowi, the farmers and traders need to modernize agricultural production equipment and to possess packaging machines. Rice drying machine is absolutely necessary since so far farmers are still drying rice in the yard or on the side of the road that lowered the quality of rice. Minister of Youth and Sports Imam Nahrawi handed over Decrees of Civil Servant Candidates (CPNS) to 286 high-achieving Indonesian athletes. In his remarks, Imam congratulated the athletes for their new role as civil servants at his Ministry. 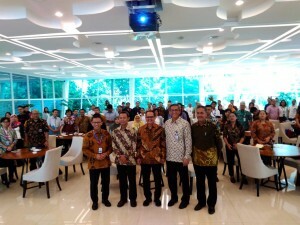 Liliyana ‘Butet’ Natsir, an Indonesian remarkable shuttler receives Decree of Civil Servant Candidates (CPNS) at office of Ministry of Youth and Sports, Jakarta, Tuesday (2/4) (Photo: PR of Ministry of Youth and Sports). Former Olympic badminton champion Liliyana Natsir on Tuesday (2/4) expressed her gratitude as she officially started her new role as a civil servant. “Thank you for the Government’s appreciation to the athletes. I hope I can do this job well. This is also a motivation for other athletes to achieve more,” Liliyana said when receiving Decree of State Civil Candidates (CPNS) at the office of Ministry of Youth and Sports. 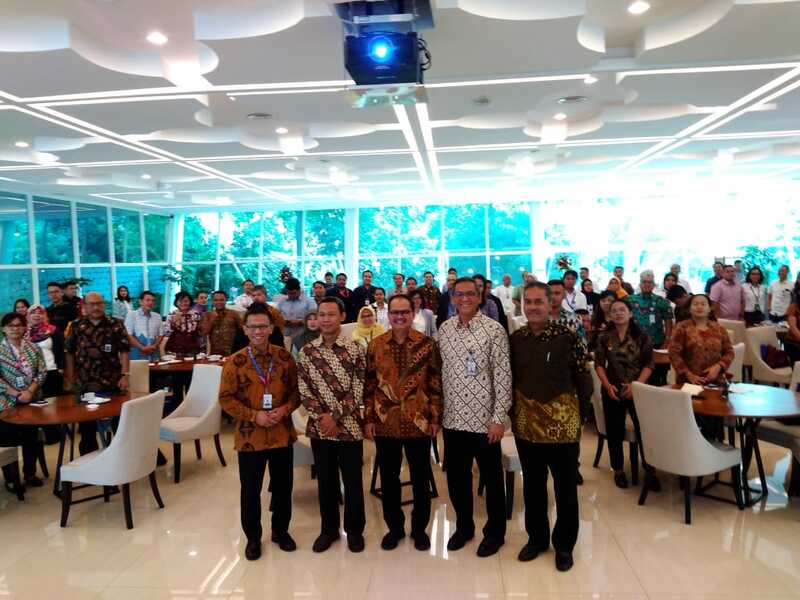 The Indonesian Government on 29 March 2019 won an arbitration lawsuit against Indian Metal Ferro & Alloys Ltd (IMFA) over the issue of overlapping Mining Business Permits (IUP). 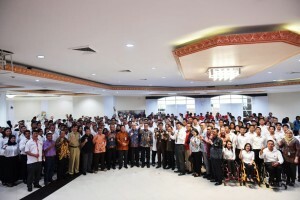 The win saves USD469 million (Rp6.68 trillion) in state finance. “We are very grateful to the Attorney General for not only preventing state losses but also returning our case fee,” Minister of Finance Sri Mulyani Indrawati said in a joint press conference with Attorney General Muhammad Prasetyo at the Attorney General’s Office on Monday (1/4). There has been a decrease in a number of cases related to village fund misuse, according to Minister of Village, Development of Disadvantaged Regions, and Transmigration Eko Putro Sandjojo. According to him, less than 100 cases were found last year in a total of 74,957 villages. Out of those 100 cases, only 67 reports were subject to be examined, he added. 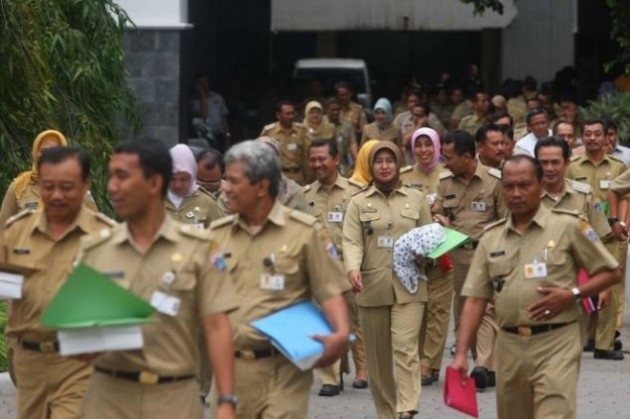 Minister of State Apparatus Empowerment and Bureaucratic Reform Syafruddin has instructed State Civil Apparatus (ASN) who become candidate for legislative election (caleg) or join any political party to resign from public service. The instruction is stipulated in Circular Number B/94/M.SM.00.00/2019 on Neutrality of State Civil Apparatus (ASN) in the 2019 Presidential and Vice Presidential Election and the 2019 Legislative Election. 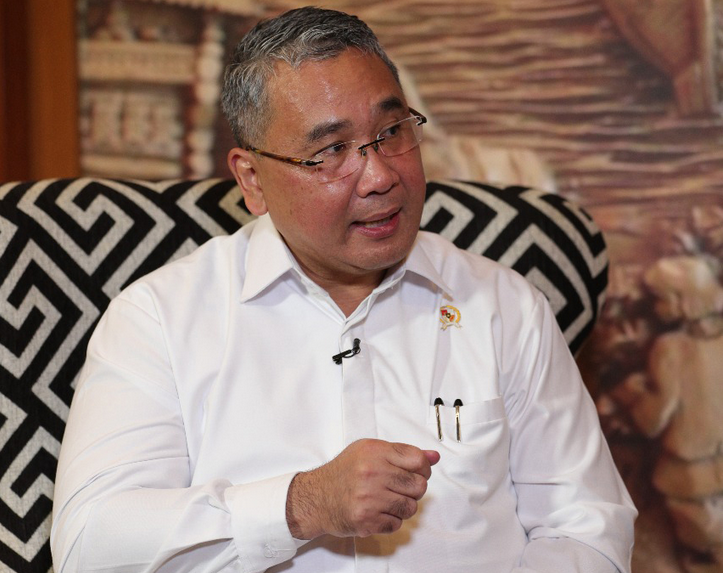 In the Circular issued on 26 March 2019, the Minister stated that any ASN who becomes candidate for legislative election must deliver an irrevocable resignation letter.